When Branch Rickey first found out about the horrors of segregation, he did everything he could to help end it. He stayed up late at night and thought of ideas to help black people get their rights. This shows perseverance by Rickey standing up against segregation and for listening to what his heart is saying (294-295). When Branch Rickey had a black baseball player at a hotel the manager would not allow the player to stay. Branch Rickey needed that player, so he threatened to go to another hotel (even though he knew no other hotel would take him). He showed perseverance by sticking to what he said, and standing up for the one black baseball player on his team (289). 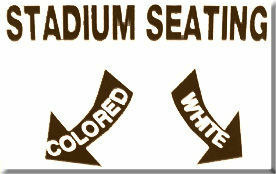 During the time of segregation, places like bathrooms, restaurants, etc. were separated for “Colors” and “Whites”. Mr. Rickey believes Robinson is the right ballplayer that is able to take on all the hate and comments from others (294). Mr. Rickey knows basically no one will like his idea of signing Robinson, but he is willing to take all that hatred (293). 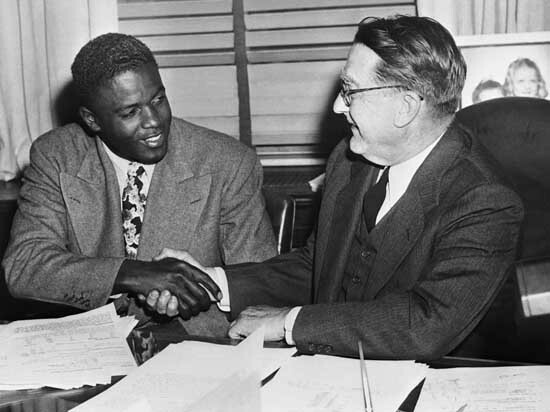 Branch Rickey signing Jackie Robinson to the Brooklyn Dodgers. Robinson, Jackie. "The Noble Experiment." Comp. Alfred Duckett. The Language of Literature. Vol. 7. Evanston: McDougal Littell, 2002. 288-95. Print.